Finding a good workout to keep your body in shape can be very tough for most of us, who have to sit through 9-5 desk jobs. Luckily, the Stamina In-Motion Elliptical Trainer gives us an opportunity to train our lower body and improve our cardio, while working in an office at your desk… Get your workout in while you work! which utilizes the same muscles used during jogging / running but without causing undue stress to the body joints such as the back, knees or hips. The In-Motion is a well featured machine in contrast to other alternatives in the market. 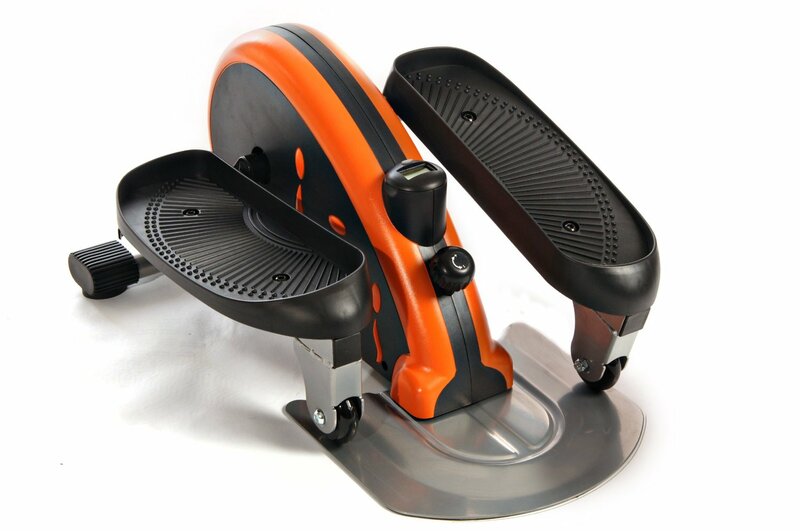 To make it an effective machine, the trainer comes with a customizable tension for controlling a variety of workout intensity and the foot pedals can be pushed in either direction (forward / backward), providing you with the ability to target various muscles. • The size of the trainer is very compact (24 x 17.5 in). It does not occupy a lot of space and can easily be kept under your working desk or in front of your couch. • The trainer is light weighed (only 25 lbs.) and can easily be carried around. It is a great way to execute a workout while on the move. • The body is made from high quality steel and is very robust. Moreover, the design itself is ergonomic and a low impact one, with non-slip and accommodating pedals. • The trainer comes with an electronic display which monitors your exercise details including the duration of workout, the strides taken and the number of calories burned. • The machine does not require much assembling out of the box. • The trainer operates seamlessly, without producing any disturbing noise, which allows you to use it with other people around you. • The trainer is not suitable for the taller people (6 feet and above). The short stride means that the legs would not be able to stretch properly for these people. This is due to the compact design of the model. • The pedals have been reported to wobble on occasions, however these cases have been remote and in general the body is very durable. There is little to argue that the Stamina In-Motion presents itself as a great deal, keeping in mind its features and low price. However, in case you are looking for a much more intensive workout, the FitDesk v2.0 Desk Exercise Bike would prove to be a better option. All in all, the Stamina In-Motion Elliptical Trainer has fared well among the users and seems like a good alternative to the external workout machines. For me, it is a great way to keep my body muscles in work despite being engrossed in a heavy load of desk work.